ELECTRIC UNIVERSE THEORY extension is needed. 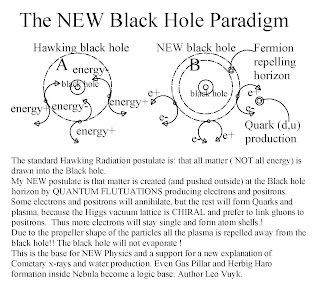 Here I present strong indications that the existing ideas described in the "electric universe" theory, need to be extended by a new black hole paradigm described below, able to explain all these charged objects like Comets up to Galaxies and Galaxy clusters which could be part of a new QUANTUM RELATIVISM, described in this blog. So for the start of a new quantum relativistic theory see next pages. by David Talbott and Wallace Thornhill. (quote)"The Sun's heliospheric circuit is connected to the galaxy via the central column and the disk of charged particles. The current path is traced by magnetic fields. The "open" helical magnetic fields discovered high above the Sun's poles by the Ulysses spacecraft are supportive of Alfvén's stellar circuit model. And the solar "wind" would seem to connect to the broader disk of charged particles about the heliosphere". The new black hole paradigm however predicts in contrast with mainstream models, some different black hole- and Higgs vacuum qualities. 1, The vacuum is equipped with a triangle/ tetrahedron network of linear Higgs trajectories oscillating along these trajectories, and transmitting photonic FORM information called "the Higgs system" which is responsible for the so called "spacetime". 2, The Higgs system comprises real shaped Higgs particles which are able to change form by collision into real shaped photons or real shaped electrons or positrons. 3, electrons and positrons are each others symmetrical mirror shapes based on a propeller form with left- or right handed pitch. 4, electrons and positrons are able to "click-on" with each other to form a so called Positronium or annihilate each other by the forming of one Higgs- and one photon particle. 5, electrons and positrons are able to "click-on" with some (5) different shaped photon particles to form all sorts of Quarks. 7, as a consequence, the Singularity does not emit photons or gravitons, has NO MASS and is not able to have some motion inside a symmetrical Higgs system..
8, The origin of such interruptions should be found in the presence of a Quark-gluon-photon based particle KNOT which is more complex than any Quark and not able to create any spin or photonic radiation. 9, the oscillating Higgs system around such a SINGULARITY KNOT will originate so called CASIMIR FORCE on the singularity knot, caused by the CONTINUOUS ABSORPTION of Higgs particles by the Singularity. 10, the Singularity Knot will originate an internal resistance pressure to the Casimir force due to the flexibility of each particle compressed inside the singularity. 11, the internal resistance pressure of the Singularity Knot is always in equilibrium with the external Casimir pressure, as long as the Casimir pressure has a symmetrical impact on the singularity. Thus, the Casimir force is assumed to be not infinite. 12, if two singularities approach each other, the Casimir pressure symmetry is influenced and the singularities are forced to move in space, or even split in two or more parts. This splitting process can be observed inside many star forming NEBULA. 13, the propeller shape of Leptons is supposed to be the origin of particle spin. 14, the particles spin however is supposed to be originated by the collision interaction with the Higgs system. 15, each Higgs collision is supposed to change the form of a Higgs particle into the form of a photonic particle. 16, around each Singularity the shape of the linear Higgs trajectories is influenced and curved into the direction of the Singularity. 17, as a result, there will be a globular horizon around the singularity where some photonic energy will travel into the plane of this globular horizon. 18, as a consequence, this globular horizon is a place of fierce energetic collision between Higgs particles and a place of creation of photons, electrons and positrons. 19, if the curvature of this horizon is between certain unknown values, then we may expect that positrons and electrons are able to form quarks (positive and negative charged) and combine with each other to form protons and neutrons. 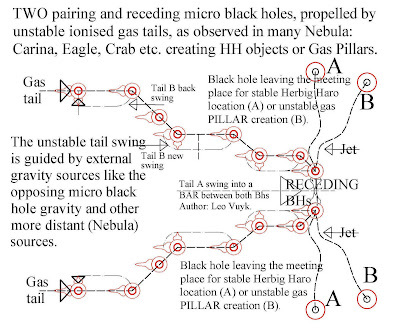 Here I present strong indications that the existing ideas described in the "electric universe" theory, need to be extended by a new black hole paradigm described below, able to explain all these charged objects like Comets up to Galaxy clusters. "The Sun's heliospheric circuit is connected to the galaxy via the central column and the disk of charged particles. The current path is traced by magnetic fields. The "open" helical magnetic fields discovered high above the Sun's poles by the Ulysses spacecraft are supportive of Alfvén's stellar circuit model. And the solar "wind" would seem to connect to the broader disk of charged particles about the heliosphere"
The most obvious example of entropy decrease in the universe. Cygnus-A gas production by at least two polar hotspot black holes. The inexorable entropy decrease is offset by adiabatic compression as gas flows inward, so that, typically, the temperature of the cooling gas follows the underlying gravitational potential. Efficient particle production at the photon horizon of black holes. Conclusion: matter is counterintuitive created around black holes. 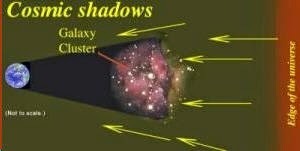 Only a part of all matter in the universe is created in the Big Bang black hole evaporation process. Black hole influence on so called truncated tetrahedron space (above). 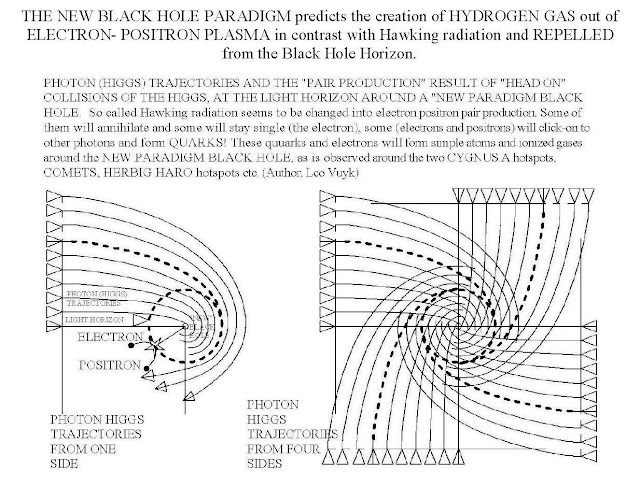 NEW PARADIGM Black Holes are equipped with a heavy compressed Higgs particle nucleus. They come in all sizes: micro: Ball lightning, Comet nuclei, (dual) Sunspots, dual Herbig Haro objects and macro: dual Galaxy anchor black holes and dual Galaxy cluster black holes. In between these dual black hole systems ionized gas is compressed into star forming regions. 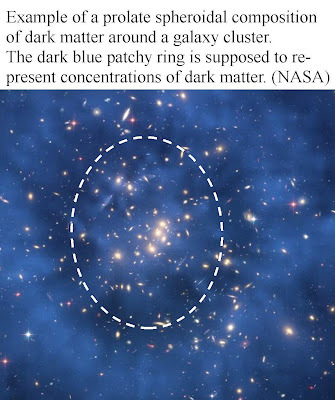 Why is this dark matter spheroid, shaped like a rugby ball (prolate) and not like a grape fruit (oblate)? Is there a connection with single elliptical Galaxies, which are also mostly prolate? 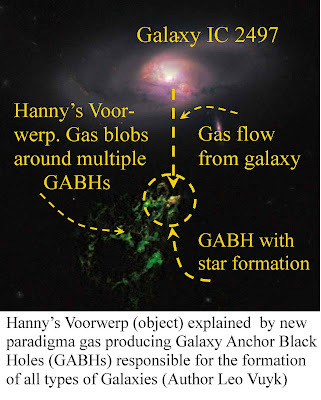 The reason seems to be that most Galaxy anchor black holes (GABHs: dark matter) turn out to accelerate and cooperate (pair) after being splintered from the evaporating big bang black hole. They seem to be paired in BH tandems of the same mammoth size, but in contrast with mainstream physics, pushed away from each other by SOFT X-RAY producing ELECTRON SYNCHROTRON JETS, originated by the peculiar Higgs vacuum deformation and the star forming region in the middle of this dumbbell system! After the merging and grouping of lots of simple galaxies, Galaxy clusters emerge. 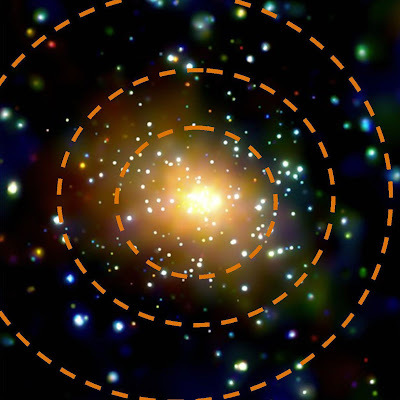 As a result the number of elliptical Galaxy increases by concentration of the Galaxy anchor black holes located outside these merging Galaxies. 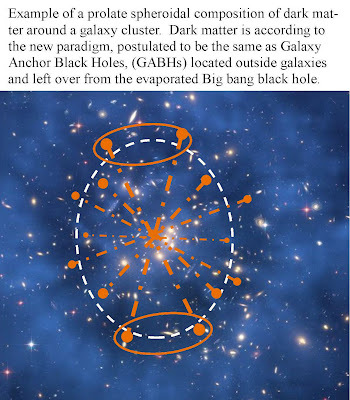 The ring of Galaxy Anchor Black Holes (dark matter) as we see it now in this prolate shaped image, is populated by variable sized tandems of GABHs. The largest sized lack hole tandems are supposed to be pushed the most out of the system and as a result be located at both summits of the prolate rugby ball. 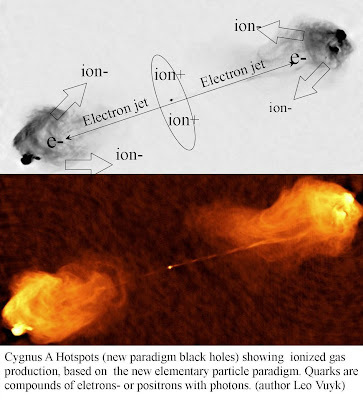 Astronomical support for the electron jets between two mammoth black holes, ( see image) is found in the existence of so called WHIM filaments which are the origin of the radial rise of soft X-ray excess, found inside the brightness profile of galaxy clusters. 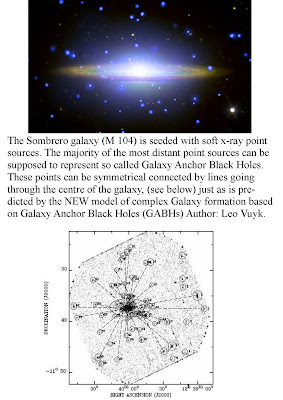 See: SOFT X-RAY EXCESS OF CLUSTERS: A TERMAL FILAMENT MODEL ETC. By: Richard Lieu and Massimiliano Bonamente, March 17 2009. M31 Andromeda with external GABHs mostly inside Globular clusters or dwarf galaxies. 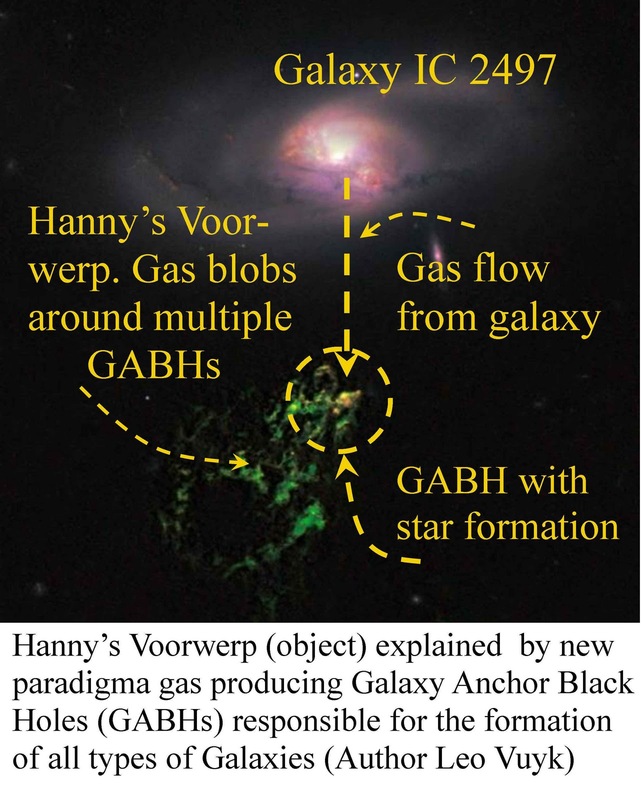 HANNY'S VOORWERP is recent evidence of GALAXY ANCHOR BLACK HOLES. in this case near the galaxy IC 2497. 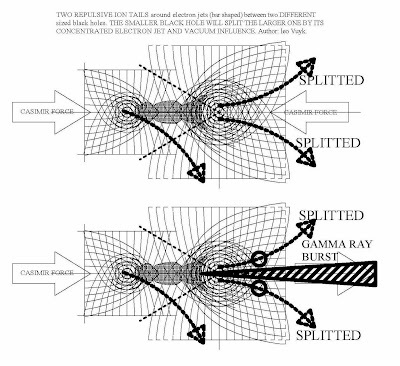 GAMMA RAY BURSTS (GRBs) explained by new paradigm black hole splitting. Two approaching equal sized black holes are supposed not to split but originate a Herbig Haro object, often found inside star forming nebula. However we found multiple examples, e.g. inside the EAGLE NEBULA of traces of “splitting black holes”. We suggest that such a splitting process should be triggered by the collision of two unequal sized black holes. The smaller black hole is supposed to be able to split the larger black hole by its concentrated imprisoned electron jet and local vacuum deformation. The result however is that the splitting process unleashes a BURST of electrons in-between the parts of the splitted black hole which can be described as a CATAPULT ejection. 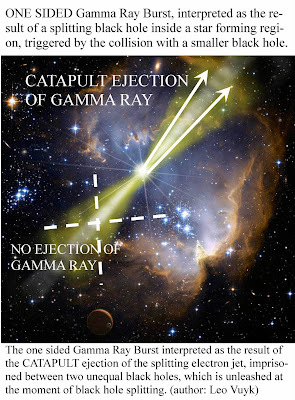 As a consequence however, this Gamma ray Burst ejection should be “one sided” in stead of the two-sided ejection suggested by mainstream astronomy. At the same time this seems a rational base for the fact that Gamma Ray bursts are so rare and able to travel well focussed over long (cosmological) distances. 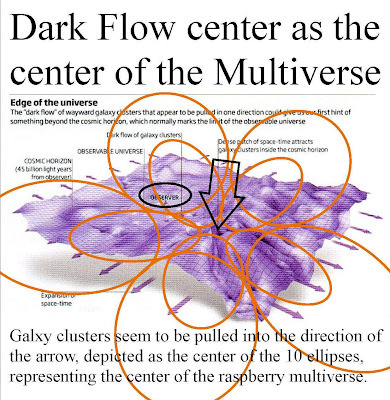 Dark Flow, the Axis of Evil and the Raspberry shaped Multiverse. The large 'cold spot' forms part of what has been called an 'axis of evil' (so named because it is unanticipated to see structure) which has been explained using several contexts: "many authors have commented about how the AE impacts our understanding of how structure emerged in the Universe within the framework of CDM and hydro-gravitational dynamics (HGD)"
Multiple galaxy clusters (31) do NOT produce a radiation shadow in the WMAP background radiation pattern (CMB) of the universe. This radiation pattern is supposed to be the afterglow of the big bang located at the boundary of our own universe.!! 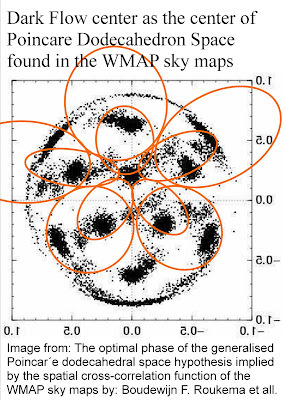 Reference: Lieu, Mittaz and Shuang-Nan Zhang, UAH, "The Sunyaev-Zel'dovich effect in a sample of 31 clusters: A comparison between the X-ray predicted and WMAP observed decrement,"
Newest adapted scheme of the solar position inside our egg shaped universe. 2: is the edge of our visual universe circular or more elliptical or deformed by the local absence of a Higgs ether? 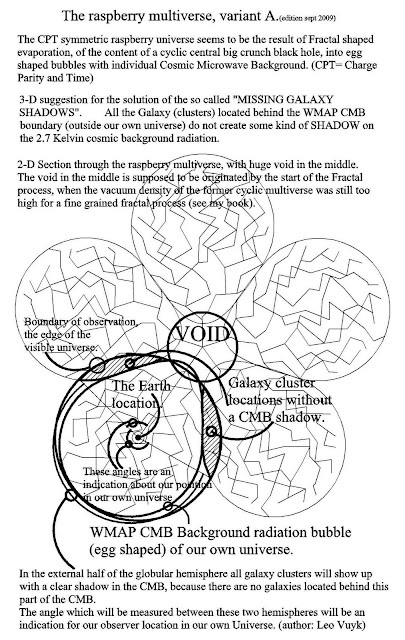 Dodecahedron space as a support for the raspberry shaped multiverse comprising 12 universes. 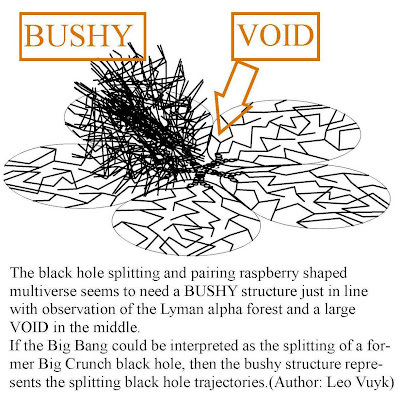 The importance of the "splitting and pairing" black hole PARADIGM for universal complexity. 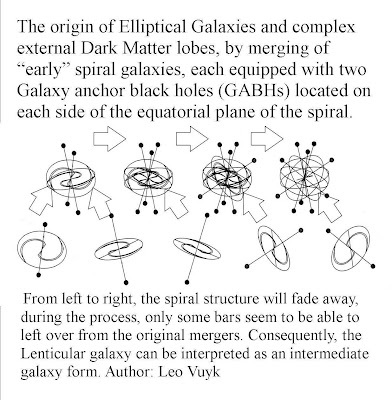 The bushy structure, resulting from the black hole splitting process, is an indication of polarisation of the galaxy rotations into a general axis which is already called "the AXIS OF EVIL"
see: M.J.Longo, "Does the universe have a handedness?" TIME is running forward because the universe is like a huge pinball machine. Spinning Fermions (the pinball) are driven by the oscillating Higgs field (the electric springs) which is supposed to be the origin of the general increase of entropy base of the second law of thermodynamics. 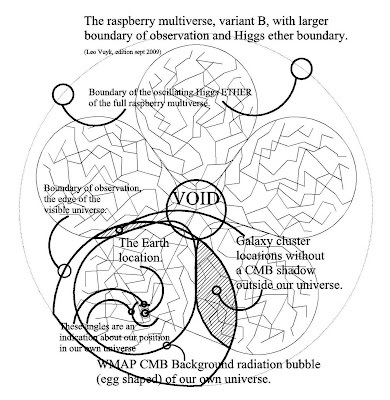 TIME IS A BY-PRODUCT OF THE HIGGS SYSTEM. However dark matter in the form of black holes will eat the dark energy of the Higgs field and decrease entropy again, reason to postulate a pulsating and cyclic universe. Universal Symmetry is not broken if we accept that each material universe is entangled at a long distance with an anti-material copy universe, equipped with opposite chirality inside the oscillating Higgs lattice field. However we have to realize that Fermions can be created out of colliding Higgs particles inside this universe and during the big bang inflation epoch. Only then we may be able to explain the efficient production of matter over anti matter without a huge annihilation process. Only then we are able to explain that ENTROPY always INCREASE with an exception for black holes, because black holes seem to EAT the pinball machine thus the Higgs system and the origin of Fermion spin and time. Conclusion Charge Parity and Time (CPT) symmetry inside an opposing second universe is impossible in such a universal system. Only Charge and Parity seem to be possible and create an Anti-Material copy universe. with clocks running backwards (ONLY according to our material observation) but without backwards running time and without INCREASING ENTROPY as a consequence. Einstein was quite clear that we need an aether. 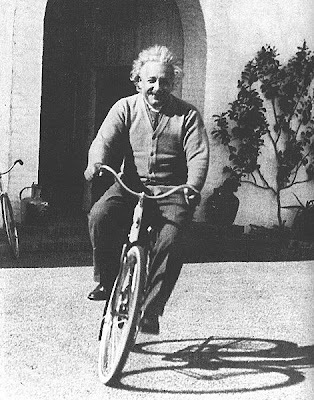 A balancing, hesitating but humorous Einstein? Einstein in his inaugural speech at the Leiden University (the Netherlands) in 1920, Einstein had by then completely reversed his view on the ether. "... Recapitulating, we may say that according to the general theory of relativity space is endowed with physical qualities; in this sense, therefore, there exists an ether. According to the general theory of relativity space without ether is unthinkable; for in such space there not only would be no propagation of light, but also no possibility of existence for standards of space and time (measuring-rods and clocks), nor therefore any space-time intervals in the physical sense. ..."
HOWEVER how does that ether manage a constant lightspeed? Radar reflection timing experiments between Earth and Venus (even Mercury) have learned us that the extra orbital light speed of the radar (reflection) light source, in orbit around the Sun, has an extinction distance which is related to the mass of the planet. These extinction distances are calculated to be: 70-54 and 21 million km for respectively Earth, Venus and Mercury. Thus, if space on the smallest scale is crystalline, then we may assume space to be based on a “Lattice model”, as opposed to the field concept of space. Today physics stands at the threshold of major discoveries. Growing observational evidence points to the need for new physics. As a result, efforts to discover new fundamental symmetries, investigations of the limits of established symmetries, tests of the general theory of relativity, searches for gravitational waves, and attempts to understand the nature of dark matter and dark energy are among the main research topics in fundamental physics today.